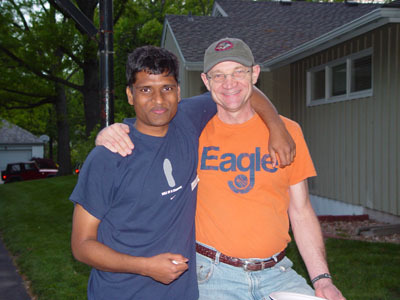 The Friendship Partner Program gives you the opportunity to get to know an American family or individual as friends and gives you a chance to enter their homes and their lives. The Friendship Partner Program, as well as getting involved in the many activities and events gives you a great chance to make friends outside the university and experience American life. It gives you a chance to interact with Americans who genuinely care about you, can help you understand the culture here, want to be supportive in many ways, and want to make your time here the best it can be! You also become an "ambassador" for your country, sharing your culture with Americans. No. You do not live with your American friend. It is simply a chance to get to know an American friend or family and to develop a what we hope is a long-lasting friendship! Hopefully for a lifetime! Many friends and students continue to correspond long after students have returned to their home countries. It all depends on the individuals involved. The choice is yours. How do you meet such a family or person? We will try to match you with an American who shares your interests as best we can. We match students as American Friendship Partners become available. take a couple of weeks to process your application. After you get the application to us we will then start to match you if an American Friendship Partner is available. After we have made a match, we will first contact you with information about your American Friendship Partner to see if you think it is a good match. You will then be contacted by your American friend. They will set up a time and a place to get together. Your friend will pick you up if you don't have transportation. Your American friend will want to get together with you a couple of times a month. Getting together less than this makes it more difficult to build a real friendship. You may be invited to go to a concert, the zoo, bicycle riding, to have dinner in their home, or spend a holiday together with them. Of course, you can invite them to do things with you too! Feel free to ask questions and get to know your friend and their family. If they have children, spend time with them too! The more time you are able to invest in your friendship, the more rewarding and enjoyable it will be! So take advantage of this great opportunity and get a real taste of America, and the midwest through building a great friendship! Again, if you are interested in having an American Friendship Partner, fill out the International Student/Scholar Friendship Partner Application. To find out more about the Friendship Partner Program, please read the ISI Friendship Partner Program Student & Scholar Guidebook. If you have any questions contact Carol Douglass.